To ensure that we are 'identifying, checking, prioritising and investigating the nature of the student achievement issue', we need to develop a 'rich picture with a high degree of reliability and specificity'. The image above shows the evidence that I hope to collected. I have already started to collect evidence below. My year 9 social studies class often struggle to understand what they have read because they struggle with the language and making meaning from text. Dr Jannie and I have been working on ways to dive deep into text so they have the ability to increase their language capabilities. Today we had a planning meeting for a lesson that we will be team teaching this week. We talked about how to gather evidence from the students around their thoughts on reading and language. The survey will support my inquiry as well as help me gage what the students thinking was behind their attitudes to reading. We talked about a student voice survey that had both multi-choice questions and open-ended ones. We then looked at an example of a text that we could dive deep into. The thinking is to give the kids multiple opportunities to dive deep, so that they could apply it, transfer it, teach it to others and be the expects of their own understanding of text and language. 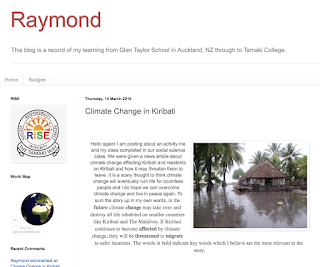 My challenge is to ensure that I constantly remind students the 'why' behind everything eg. why I am doing a survey, why I want to find out about their reading etc. Jannie will then dive deep into a current event article, focusing on the first paragraph only. Here is our draft powerpoint below. We want the kids to practice 'mindful reading'. We can live a thousand worlds through reading...we could be sailing on the Pacific Ocean, we could be on a camel in Egypt, we could be at the top of Mt Everest...we can understand others and the world around us better. There's never enough time in the day to really dive deep into anything really, let alone text! 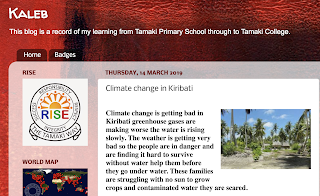 In our attempts to find the time for my year 9 social studies class to develop language, Dr Jannie and I came up with the idea to collaborate with their English teacher, Makerita (Ms Feps) to collaborate and design a course that will build a rich programme of language learning and making, to help support our students. Our initial brainstorming planning meeting was held 15th March, where we were pitched the idea to my year 9 classes English teacher Makerita. We talked about themes and how it could look to both subjects and ways we could collaborate on the teaching and learning of texts. After the meeting we went away to think about what we needed to have done individually with our separate achievement objectives and also ways to connect with each other. 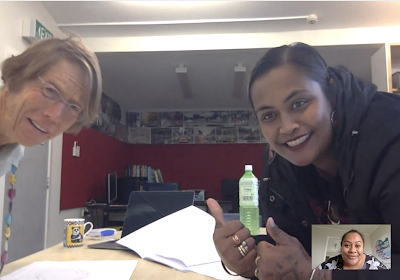 Today we had a google hangout session where we focussed on the plan itself. We started with brainstorming, then talked about ideas for creating and sharing of the student learning. 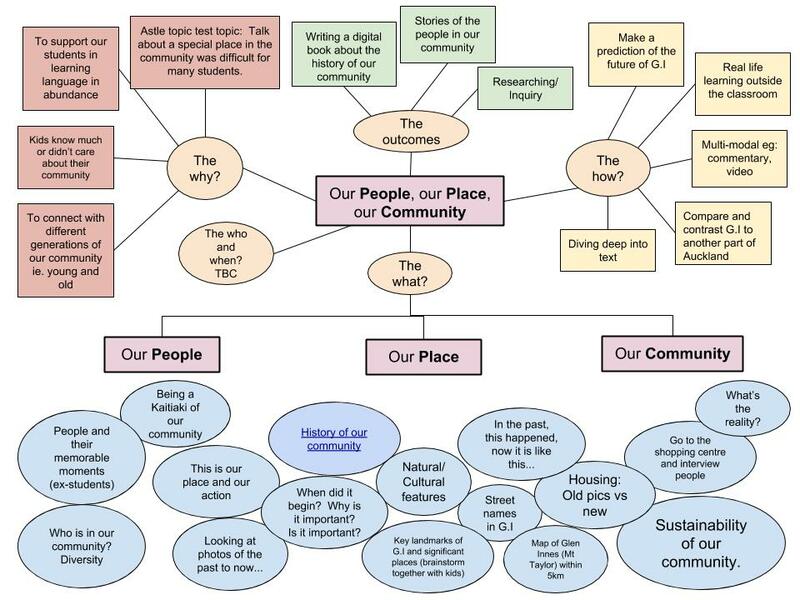 I discussed the problems students had in connecting with their community and we unpacked what the reality was and how we could develop it further. Here is a brainstorm plan that I developed from our meeting. 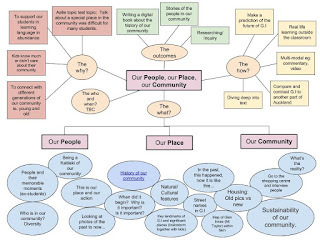 The blue circles underneath fit under each area of people, place and community so I didn't try to link them together. We will discuss this further at our next meeting this Friday. One of our department goals is to utilise literacy strategies across our junior school to support achievement in reading and writing. 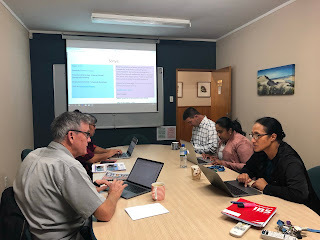 At our department meeting today, our team shared some of the literacy strategies that we have learnt from our PLD with Marc Milford, our literacy guru, who was present to provide feedback and feed forward. There were lots of good activities that our team shared which was really great to see. One particular strategy that Sonya Robertson had taught in her classroom, utilised resources from a site called Newsela (anyone can join the newsela site with their google account). 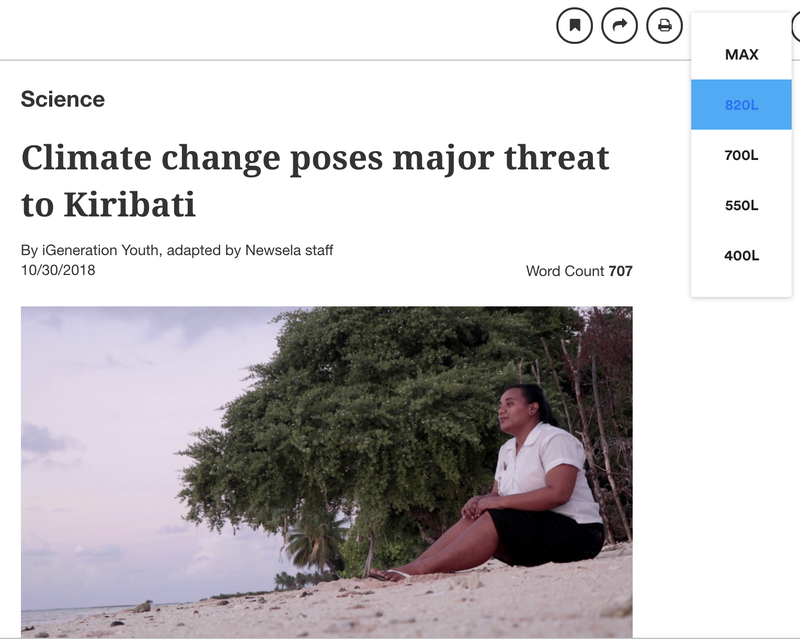 On the site, it has current events articles that allow you to choose the reading level applicable for your kids. Below is an example. 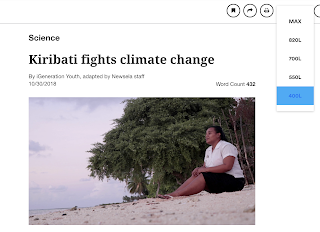 The title and article are for the less able readers as shown by the drop down box. 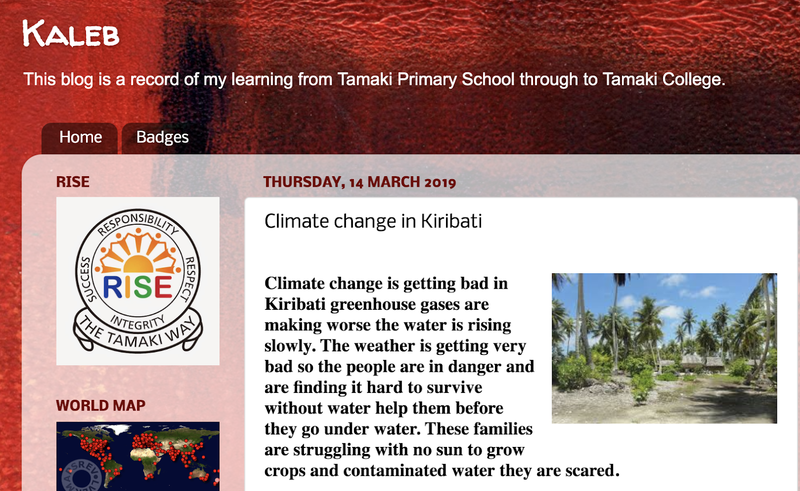 It was awesome to hear how students such as Kaleb, who has had time off school, show his learning in his blog. Sonya pushed him to get it done and she shared how she felt she had made progress in helping him with his work. Marc was really impressed in the modal verbs that some of the students were using and suggested that a point be made to the students what the modal verbs were and how these helped develop their summary. I was really proud of the strategies that Sonya and the team have used so far to address the learning needs of our kids. I look forward to hearing more in the future. At our CoL meeting today, Dr Aaron Wilson shared his insights around how to build a 'detailed and robust profile of our students in relation to that student learning focus'. Before this meeting, we had to find out what was going on for the learners in my classroom. I needed to figure out how to find this out so of course I started by googling it. I wondered about student engagement to try and build a picture of how we can look more closely at engagement. Reflections on the effect of my practice on engagement. (c) Emotional: kids feel secure in the relationships with teachers, classmates and school. I have been thinking of the me and my survey that Dr Graeme Aitken had alluded to at a PLD last year and I am reading through the background of the survey to understand it more. 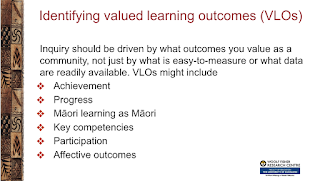 Come up with a plan to build a rich picture in relation to the valued learning outcomes that we have identified. What is a common focus? Is this a common focus across our CoL team? Do we have similar approaches to profiling the students? I need to think of a plan. 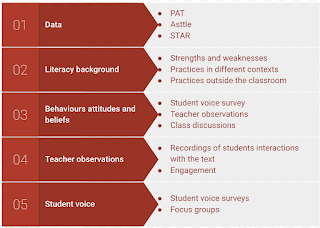 The next stage for our inquiry is to look at describing tools/measures/approaches that I plan to use to get a more detailed and accurate profile of students' learning in relation to my challenge. We then need to justify why we chose these approaches. I want to break down what this means further. Idea #1: Is there a lack of resilience in reading or behaviours when it comes to text? What are their attitudes to learning? Do they like reading/writing? (3) Explain why you judge this to be the most important and catalytic issue of learning for this group of learners this year (In chemistry, a catalytic substance one which increases the speed of a chemical reaction). To help me understand how I got to my inquiry challenge, I've had peel away layers and layers of what I'm going to call technical 'bull crap' and get to the crux of what has been annoying me (if you want to call it a flash word, I'd say I have been metacognitive - thinking about my thinking). 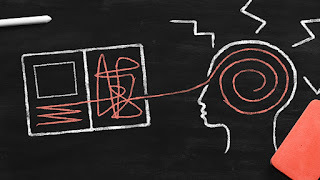 It just dawned on me as I've scribbled down countless brainstorms, read numerous academic research and rummaged through top teachers' blogposts - I have to make the main thing, the main thing. What is happening and not happening, in my classroom for my learners and what have I done to contribute to it? (And the buzzer goes off)...ehhh, wrong. In reality, most of the class said social studies was one of about three other subjects they liked and then they proceeded to muck around and distract themselves and each other for the rest of the period and there was very little real work done and I ended up keeping half the class in for doing nothing. What I was essentially doing and have been doing for a long time, was cover up my inequities by pretending that everything was beautiful when in reality, my inquiries focussed on sharing successes about students who were achieving well because of what I thought were my actions as their teacher, when I should have been looking equally as much at students who were not achieving well because of my actions as their teacher. But there is hope... because we all want what is best for our learners and damned if I'm gonna give up trying to figure out what works and what doesn't work! This is not just a job, it is a vocation (cue the violins... ah to be honest, I do actually believe this). All jokes aside, I have come to realise that what starts with me, ends with me and that these are kids who are in my care and they deserve to have the best educational experience ever. At school we always talk about the Ideal student. What does the ideal Tamaki graduate look like when they leave school? What is it that I want my kids to have achieved when they leave Tamaki College? 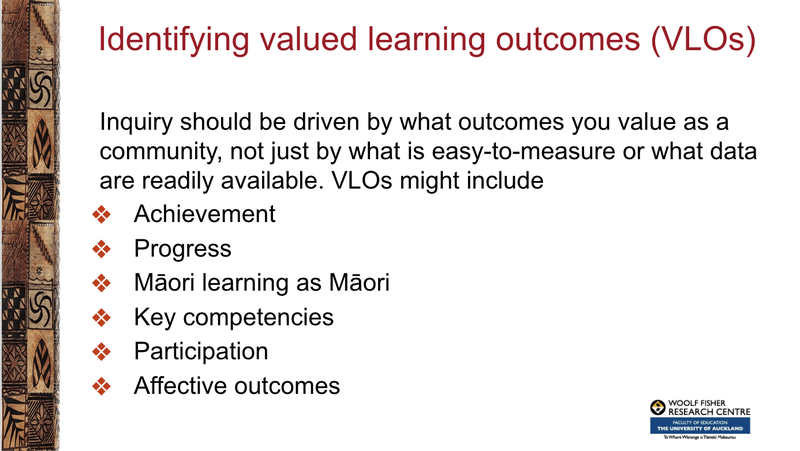 Is it success based on outcomes eg. NCEA or producing people who are informed, confident members of society? Or is it both? Graduating seems so far away for our students...which is why I want to start with the year 9's! Plant the seeds now, then watch it grow, blossom and bloom (with lots of water, sun and all the other stuff that plants need to grow!). In my next post, I will be summarise the challenge of student learning that I plan to focus on in this inquiry. There are a few reasons why I wanted to focus on reading this year. 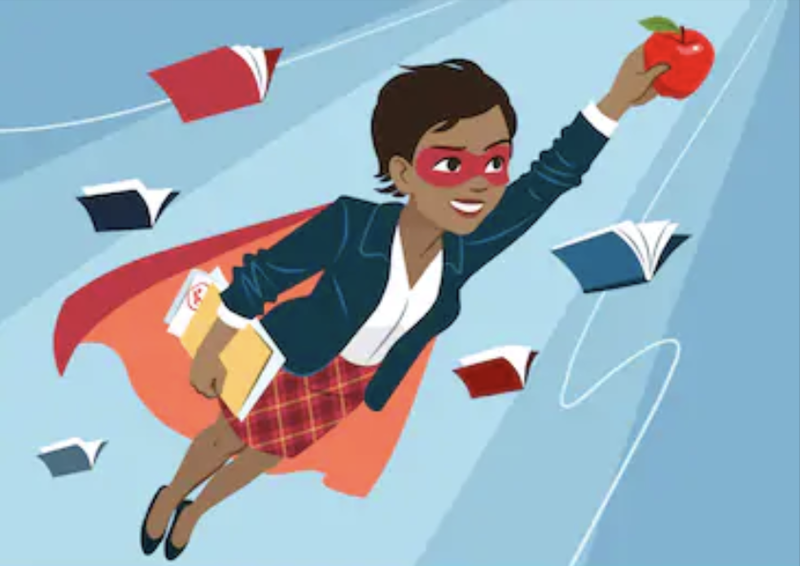 The first was that in the past, my inquiries have focussed on improving writing and from my inquiries I've found that part of the reason why kids are still struggling with writing is that they struggle with reading. Kids won't write a summary about an article if they don't understand what they've read. Secondly, reading as a focus, has not been an aspect that I feel we have focussed on or addressed purposely in our department which I know should be happening. 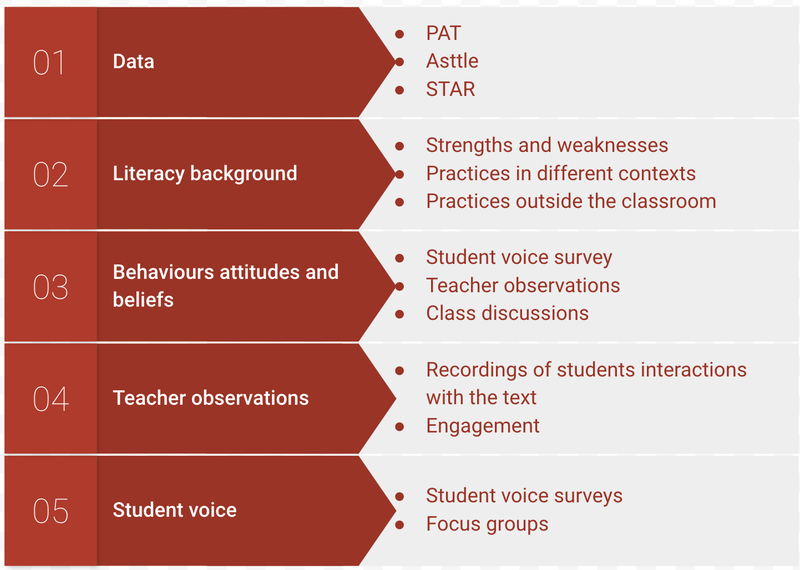 Although contexts are interesting and engaging, bringing reading to life for a struggling reading can sometimes be difficult particularly when there is a vast range of learning needs in the classroom. To be effective in our department, I know there needs to be a shift in how we use reading to accelerate learning. Lastly, the Woolf Fisher Research team presented evidence that reading has made the least shift for our students- if anything it has gone backwards. I wanted to explore why our results were so poor and I wondered how much of these results were because of a lack of focus in the classroom. Over the next few weeks, I will be looking at gathering data and thinking about ways to tackle the challenge with the support of experts in literacy such as Dr Jannie Van Hees and Marc Milford, our literacy expert. The 'Writing Plan' for our Junior school. A summary of my BIG inquiry: Raising the achievement of boys' writing by implementing engaging contexts and effective writing strategies.